The Muslim Brotherhood's Mohamed Morsy has secured victory in the presidential runoff, his campaign announced in the early hours of Monday, as vote counting wrapped up at most polling stations across Egypt. In a press conference at the campaign headquarters, Morsy's campaign said that their candidate has won 52.5 percent of the vote, while his contender, former Prime Minister Ahmed Shafiq, garnered 47 percent. Counting has been completed at more than 97 percent of polling stations, according to the campaign. Morsy arrived at the press conference to thank his followers for his victory and reassure skeptics. "I thank God for this victory. It's a victory for all Egyptians," he said before a jubilant crowd. "We come with a message of peace, to everyone… to the revolution and the revolutionaries… to men and women, mothers, sisters, workers, students, to Egyptians outside and inside Egypt, to Egypt of the Muslims and Egypt of the Christians." Morsy vowed not to "settle any account for now" and said that his program is more interested in building a "civil, democratic, modern and constitutional state." After the announcement, a handful of Morsy supporters chanted, "The free revolutionaries will continue to victory!" and "Down with military rule!" 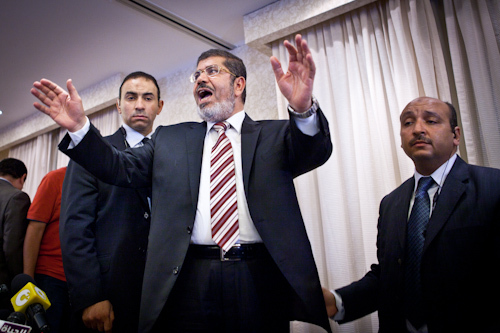 Some non-Islamists supported the Brotherhood's candidate in hopes that he will present a greater challenge to the military and entrenched state institutions. But many revolutionaries were quick to declare that this does not mean they will be Morsy supporters for long. "I am not happy about Morsy's victory, although I voted for him. I will join the opposition starting now," Wael Ghonim, an early activist in the revolution, wrote on Twitter. Meanwhile, Shafiq's campaign announced on television that they reject the initial results. In a call to the CBC television channel, Mahmoud Baraka, Shafiq's campaign spokesperson, said that the Brotherhood's Freedom and Justice Party results are the opposite of the truth and an attempt to control the media. Baraka said that initial results show that 52.5 percent of the vote in fact went to Shafiq, while Morsy only got 47.5 percent. Baraka claimed that 13 percent of the polling stations are yet to announce their results. According to the FJP's count, 23,841,259 cast their votes, or over 45 percent of the 50 million eligible voters. That number, which is based on 97 percent of polling stations, is expected to rise. Early projections put Morsy ahead by a landslide, but that margin thinned as new numbers came in. Much of Morsy's support came from Upper Egypt, while Shafiq fared better in Cairo and the populous governorates of the Nile Delta.